November has been an amazing month. It was great being back in Chiang Mai and getting back into a bit of a routine as well as starting a few new projects. 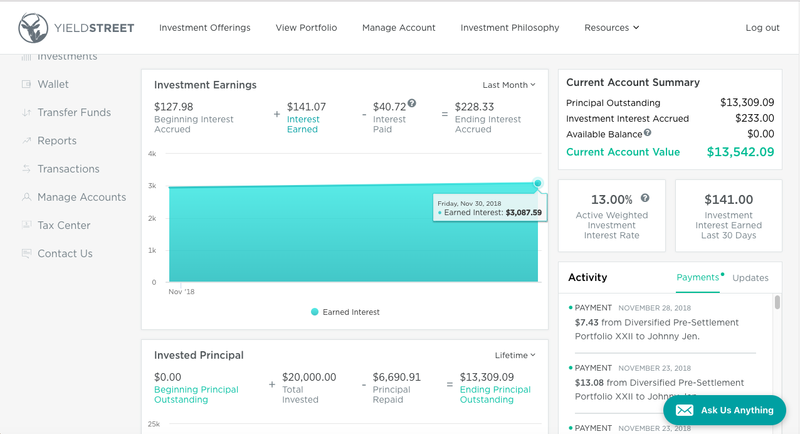 I also accidently discovered that everything I've done these past 10 years of traveling, living cheaply, and working online has helped me achieve something that the FIRE community which standards for Financial Independence, Retire Early, aspires to. That includes having my expenses be as low as possible, while the left over 75% goes towards investments that will eventually allow me to retire early. Even though it's something I stumbled upon and have been accidently doing, it's actually the perfect way to achieve financial independence, while actually enjoying life to the fullest now. 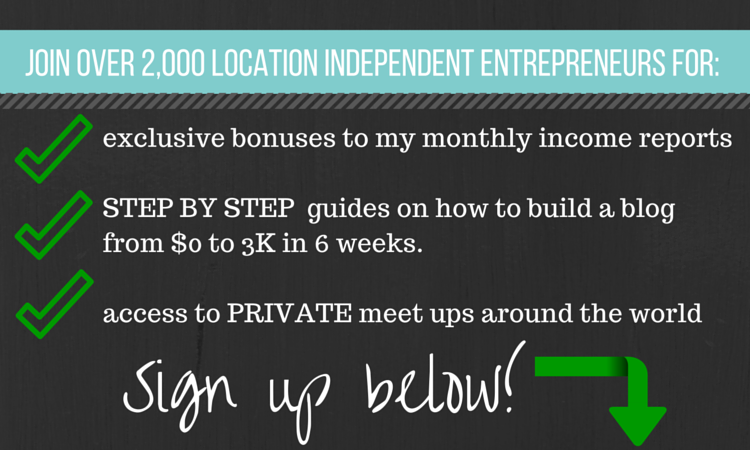 Being location independent and working online, has allowed me to travel to exotic locations, while having everything paid for through tax savings, being able to expense most things as a business write off, and have a lower cost of living overall. My trip to Bali last month was 100% a business expense as the primary reason I went was to attend the dropshipping conference, and this month coming back to Chiang Mai is another one. In this month's breakdown, I'm going to show you everything that I earn money from online, and more importantly everything I spent as well. A lot of people don't realize this, but it really doesn't matter how much money you earn, it's how much you have left over at the end of the month and how much goes towards investments that really counts. Keep reading for screen shots and info inside my dashboards of the good, bad, ups, downs and future plans. I started the month in Bangkok just for a few nights to hang out with my cousin Larry who happened to be on vacation from California. It was perfect timing as I had to fly through Bangkok anyways on my way back from Bali. It reminded me how much I dislike big cities, traffic, and the hustle and bustle and why I choose to live in Chiang Mai instead. The good thing was I that I was able to check out a couple of coworking spaces while I was there just to see what they 'd be like. First up was Urban Office which falls under the "looks beautiful, but isn't actually functional as a coworking space" trap. Then I went to the Hive Thonglor which is actually a place I could see myself working from if I had to live in Bangkok. A lesson learned was flying out of DMK for domestic flights, even, if sometimes a tiny bit cheaper, isn't worth it as the airport is further out of the city than BKK and is overall a worse experience. Lesson learned is to skip Air Asia and pay the extra $10 or so to fly with Thai Air or Bangkok Air whenever flying from Bangkok to Chiang Mai. If you've never been to Chiang Mai in November, it's the best month of the year to come here. The weather is perfect as it's dry and sunny during the day, and cool in the mornings and evenings. For fun this month I did a lot of activities nearby including fishing for giant mekong catfish, and then the next weekend spending it at an incredible infinity pool in the mountains. This month was also Loy Krathong the Lantern Festival and it was so gorgeous looking up at the fire lanterns fill the sky. If you haven't yet, make sure you check out my blog post with my Favorite Things to do in Chiang Mai. 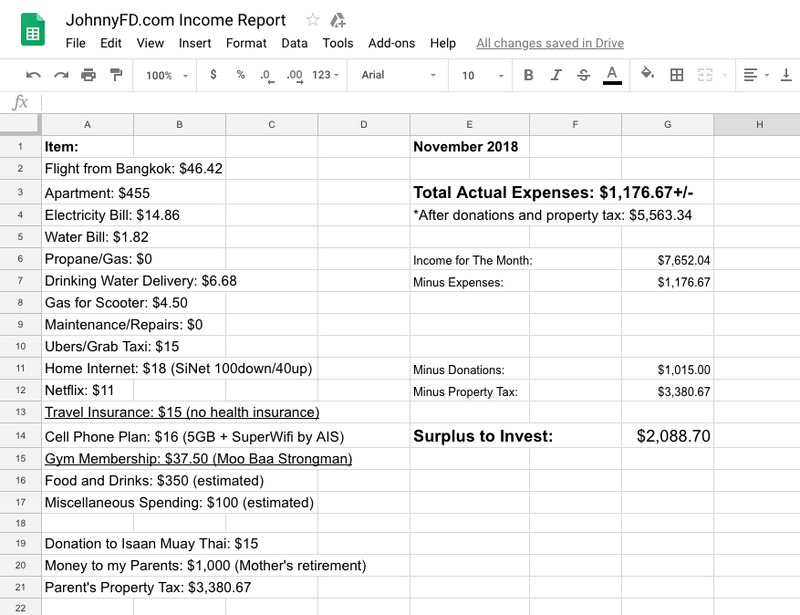 You might think that with all of the incredible things I seem to do each month that my expenses might out of control, but the reality is, it's still way less than what I would spend back home living a normal life. 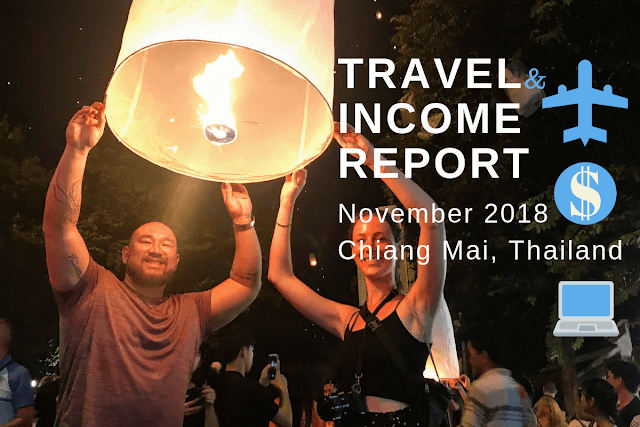 If you really want to know about the bare minimal costs of living, then you should read my first book 12 Weeks in Thailand: The Good Life on the Cheap as it breaks down in detail how I managed to live for the first four years on a $600 a month budget and was perfectly happy to do so. However, even though I can live for a lot less as a lot of my expenses are non-essential, I also love enjoying life now, especially if the things I do are a good value. Things like spending 700 baht ($21.30) on a coconut frappuccino may sound like a terrible use of money, but the fact that it allows me to use the pool and spend the entire day at a 5-star resort in the mountains to relax, unwind and enjoy the same life as someone spending $250 a night, making it a great value. In fact, sitting next to us at the pool was a couple where the man was 67 and had just retired and his wife just a few year's young is still working. Even though they were loving their time there, by now they're already back home still paying down a mortgage and living an expensive life. For me, I get to do this 30 years earlier and can go there every weekend if I wanted to. Or better yet, go to a different 5-star resort every other week for some variety while going home to my super comfortable condo in the city center, eat out 21 meals a week, and have a house cleaner come whenever I need them while still living for around $1,000 a month as a base cost. The only giant expense that doesn't really need to be there, but is something that I'm happy to do, is paying for my parent's property taxes as well as giving my mom $1,000 a month to help with her retirement so she can be financially comfortable without working. Here is everything I spent this month. My annual thank you gift to my parents for raising me. 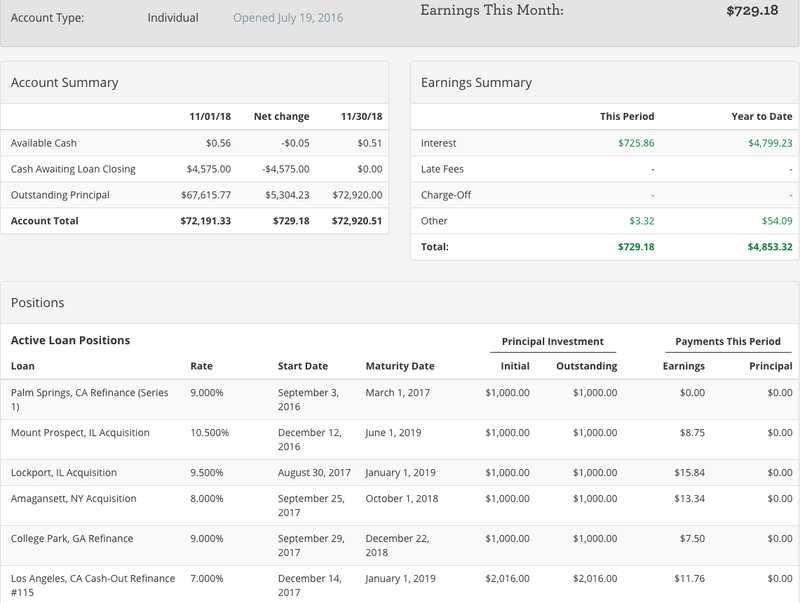 As I do every month, here are screen shots of some of the sources of income that I earned for the month. 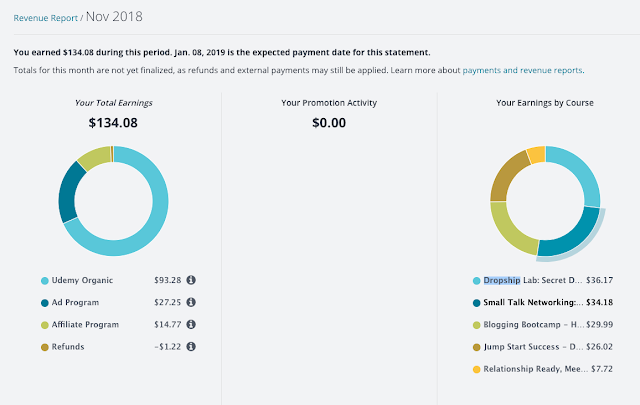 Some items don't have dashboards to share and some things payout quarterly and not monthly so a few aren't shown, but in general, these insights can give you an idea of what is working, and how much money each source is earning. Be aware that, even if something don't look like it makes a ton of money right now it's mostly because I'm not that focused on it, and not because it doesn't work. For an example, I have a friend who made $11,000 as an Amazon Associate last month as it was Black Friday. 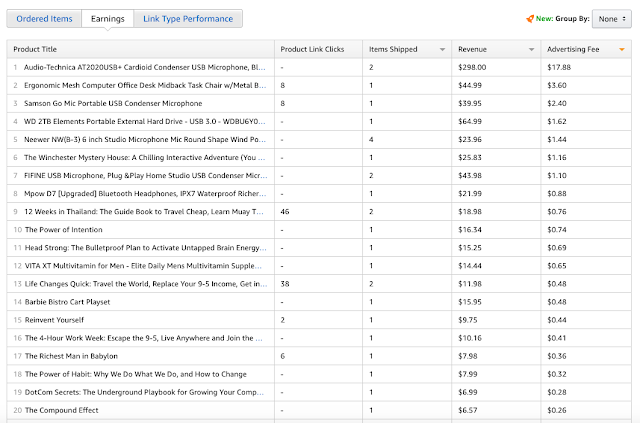 The only reason why my Amazon affiliate earnings is so low is because I didn't focus on promoting it, and 100% of my Amazon referrals come from posts I've written years ago like this USB Microphone Review post that I wrote in 2015 that still earns me passive income every month up until today. 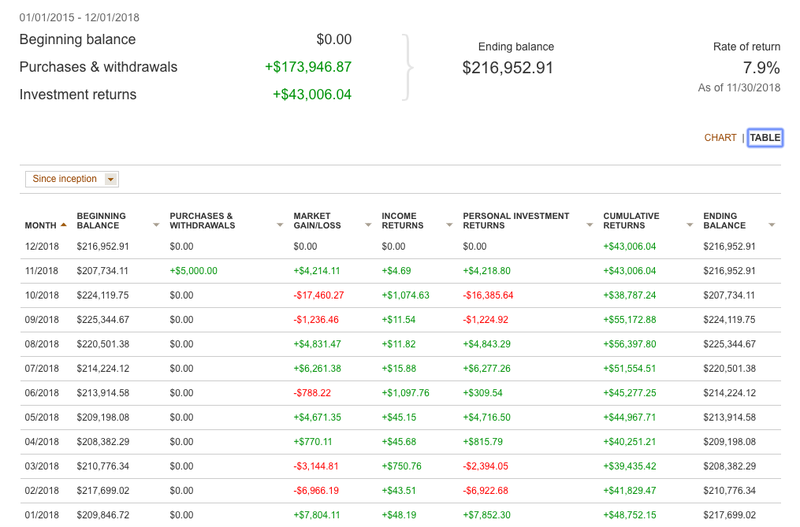 Also not included in my income calculation for the month are gains or losses for my investments if I didn't actually sell the shares to cash out. So even though my Vanguard fund technically went up by $4,214.11 this month, I don't count that as income as it fluctuates up and down each month and you don't technically make or lose any money until you sell the shares. 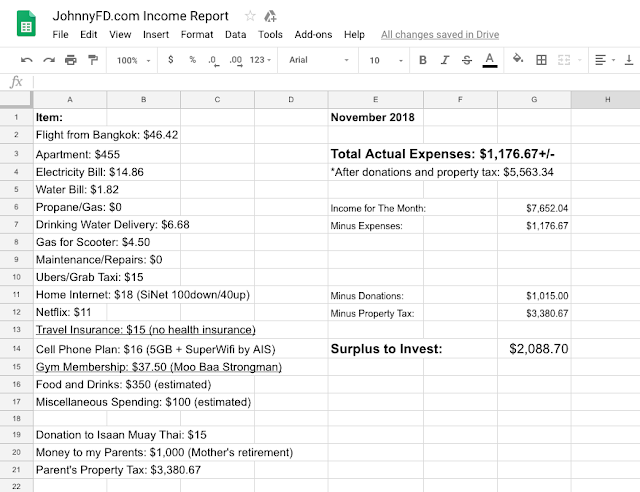 Below is a screenshot of the spreadsheet I use to keep track of where my income comes from including book sales, udemy courses, dropshipping, dividends and interest collected from investments, ad revenue from youtube, podcasts, income earned as an affiliate, and income earned coaching, doing seminars or putting on conferences. 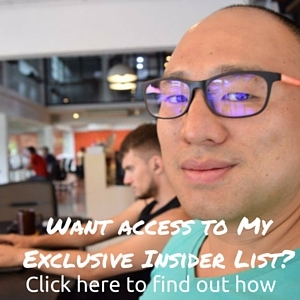 All numbers are net profit after expenses, and if you want more details and the how to, you can join my Income Boss course where I break down everything in even further detail. If you missed out on the Black Friday sale for the course, you can use the coupon code JFDBLOG at IncomeBoss.com for an extended discount that's still valid this month. This month was the start of the new dropshipping partnership program. 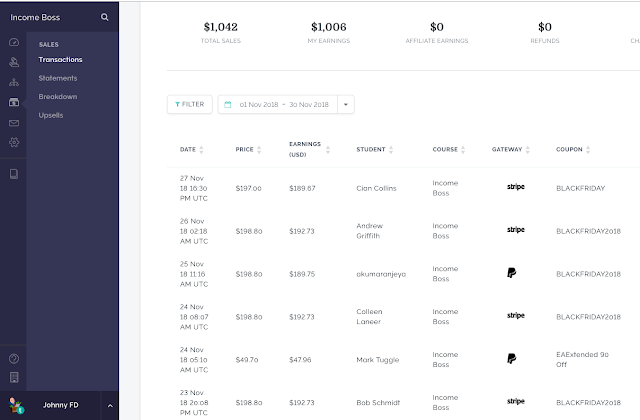 As those who have been following along these past 5 years know, I've now started and sold a handful of dropshipping stores on my own and with partners, and the income I've generated from both the monthly profits of the store as well as the windfall cash that I've gotten from each sale has allowed me to purchase $173,946.87 in low cost index funds through Vanguard as an investment. 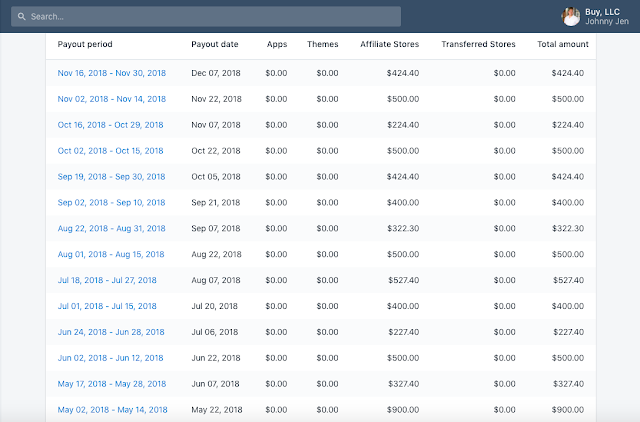 That money has now earned me an additional $43,000, making it the ultimate source of passive income. The only problem now is that once the stores are sold, it's time to build new ones, which is why I decided to start up another batch of stores. 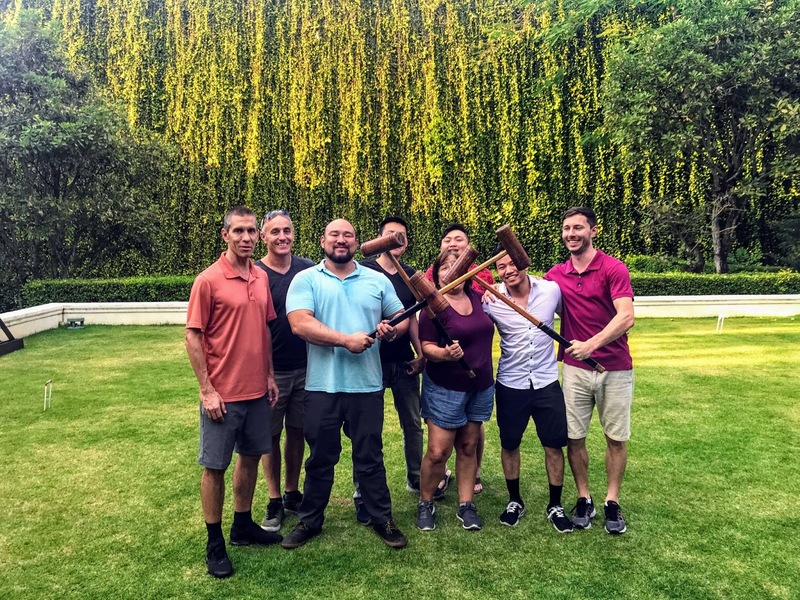 Six weeks ago I sent out an email to my newsletter subscribers asking if anyone wanted to move out to Chiang Mai for two months and build stores together. A ton of people said yes, but many of them couldn't make it out in time. I took the remaining 20 or so applicants and decided to choose 7 of them for this year's program. 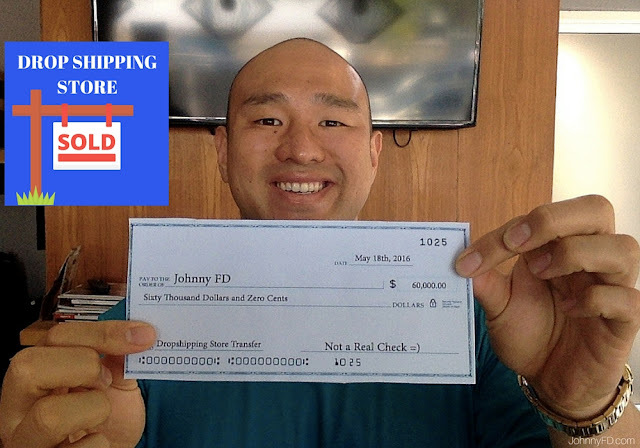 We're all members of Anton's dropshipping course and am using his method of selling high ticket products ranging from $300-$1,000. For those who didn't get chosen this year, a big part of it was I wanted people to have already been a part of the course for a while now and have tried it themselves, or otherwise had some experience or training before jumping in. My plan worked out and within 3 weeks of us starting this program, all 7 partners already have stores up and running with suppliers on board. I'll keep everyone updated with our progress in future blog posts, but the goal is for us to launch the stores and start getting sales by the end of the year, run them for a year to maximum profits, then sell the stores after 14 months like I did with the previous 4 that I've sold. Then taking that money and putting it into investments which will continue to generate truly passive income for the rest of time. Some of the dropship partners celebrating the progress so far. It's honestly kind of strange being this transparent with my numbers. I think that the longer I do this, and the more I share, the more comfortable I get with showing the ups as well as the downs. If you ask me why I do it, it's honestly because I wish others would do the same. 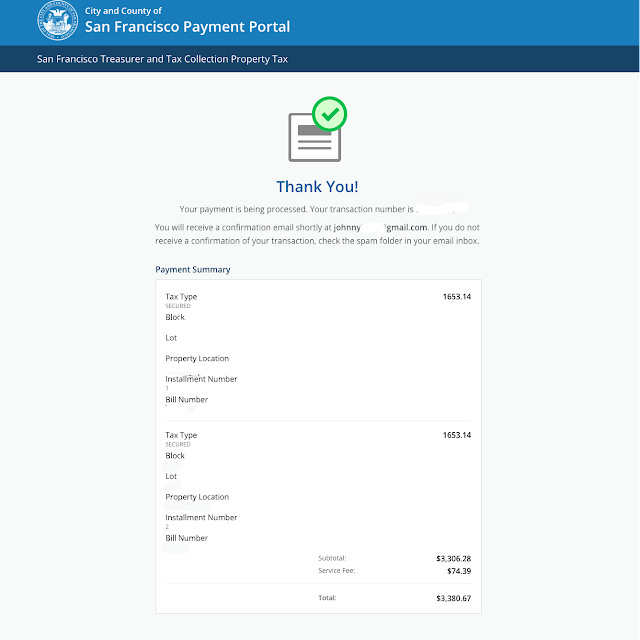 I'd love to see a trend of everyone being transparent with their numbers as it would make learning, growing and improving our businesses while cutting out expenses much easier for everyone. Another reason why I do it is because it keeps my accountable to both myself as well as to those who follow my journey. 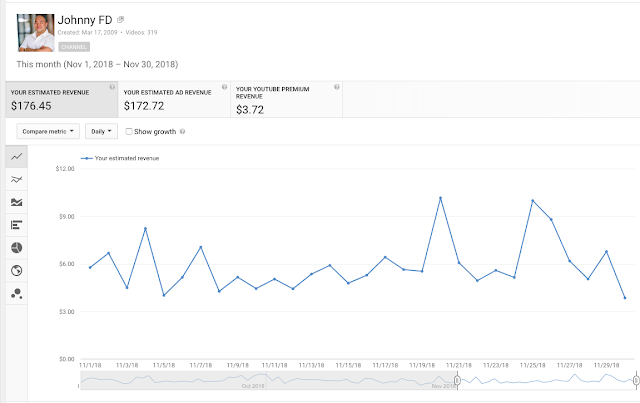 Earlier this year from March - September when I basically took six months off of work on passion projects that didn't make any money and just coasted in maintenance mode while traveling and enjoying the summer in Europe. But even then I always had on the back of my mind how many people I was letting down by not doing as much as I could and was capable of. Luckily I got my act together a few months ago and have been working hard and taking on new projects once again. The goal for December is to finish organizing the upcoming Nomad Summit, get the remaining speaker's confirmed and announced, fill up the remaining two sponsor slots and start marketing the conference hard to hopefully beat last year's record of 400 attendees. 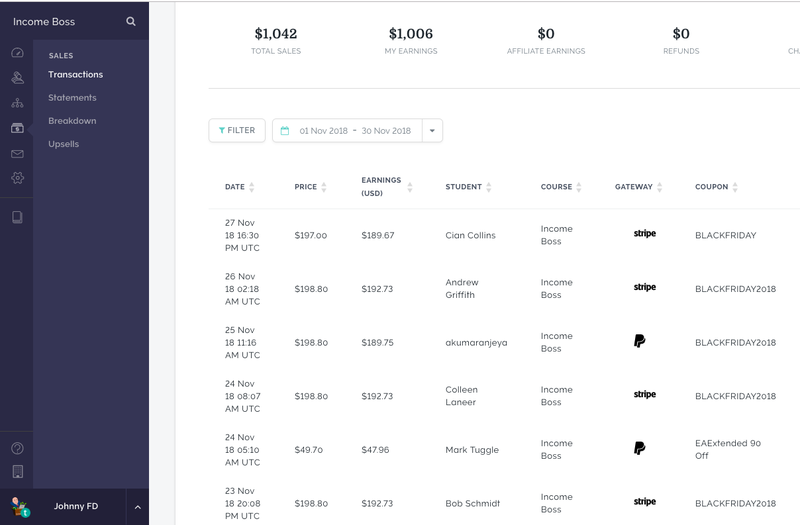 I'm also meeting two the dropship partners twice next week to focus on optimizing their product pages so they'll convert higher, and my partner Sebastian, will spend the rest of the month with them optimizing traffic and ads so we can start getting sales by year end. There's a lot to do, and it'll be a busy month regardless as I'll be going on a scuba diving liveaboard trip in the Maldives just before Christmas, but I'm excited to end this year strong! Let me know in the comments what your goals are for year end, and for those who are aiming for financial independence, where you are on the journey and how much money you're spending and earning each month. Lets rock this and achieve FIRE together! 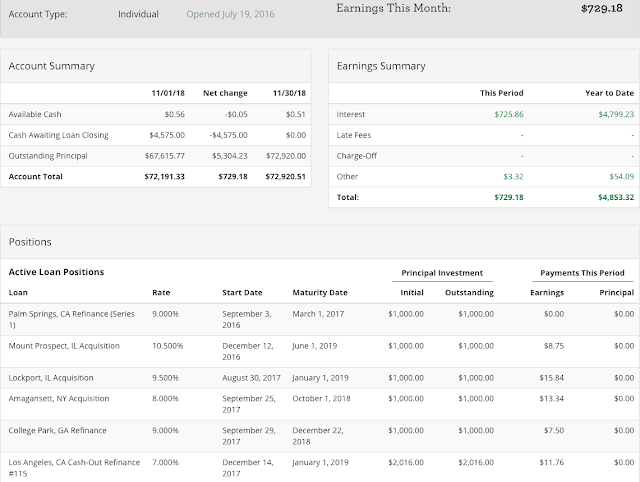 Ask a question, or leave a comment about anything from this month's income report here! 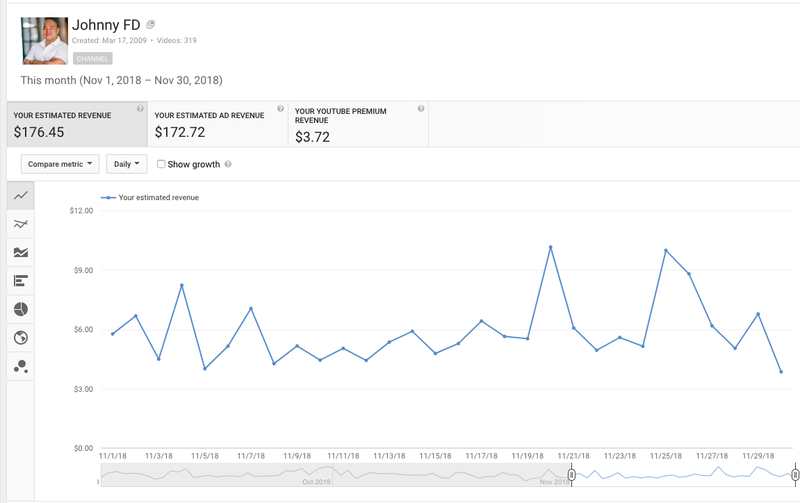 Great to see that you're still doing this after all this time and still promoting dropshipping as a great way to build an e-commerce passive/semi-passive income stream! 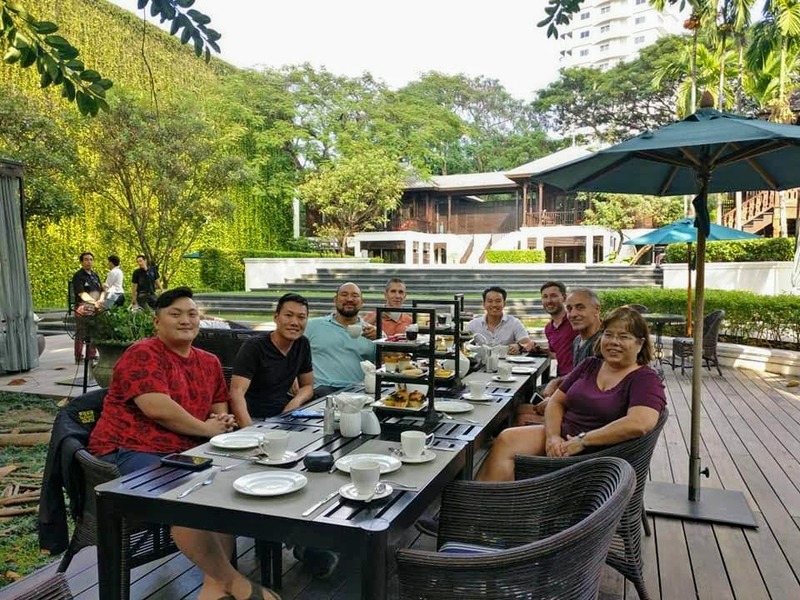 You were actually the first online mentor/influencer I ever found in regard to building online businesses (back in Nov-December of 2015) and I promptly enrolled in Anton's DSL course during the New Year sale... 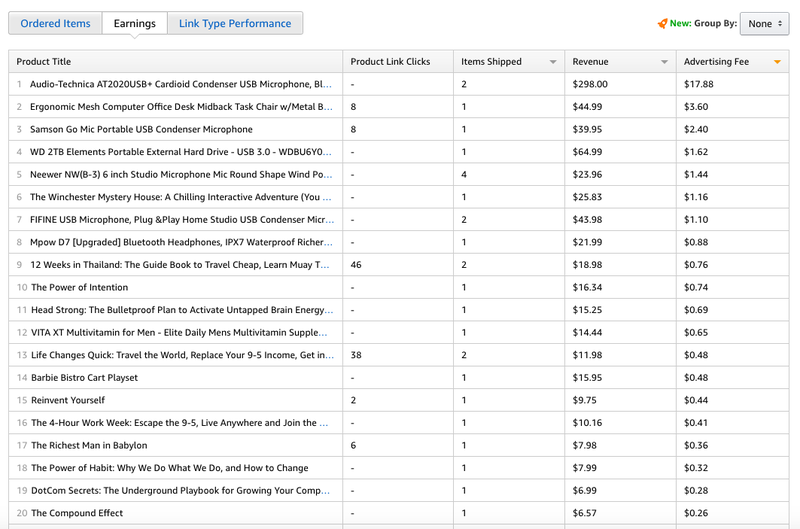 Sadly, I got distracted by Amazon FBA and the idea of using that method instead of drop shipping to create passive income streams (not that there is anything inherently wrong with it), but that brought along a long cascade of "shiny object syndrome" and many thousands of dollars and different courses later, as well as many failed attempts at FBA... Here I am, 3 years later with nothing to show for all that time and coming right back to my roots and actually re-starting the DSL program I bought and never even started going through because of those distractions (also I'm part of your Income Boss program and I need to start and complete that course after DSL). Sad that so many different distractions got in my way of real progress, but I learned a lot in that time period and I am now more motivated than ever. Just good to know you still are doing this consistently and promoting Dropshipping as still a viable option. It seems like my best bet all along and I'm really going to nail it down this time around. (Im a young guy, 23 years old with dream to be a millionaire by 25). Thanks for all the great content you put out, and keep it up with your transparency and honesty! Hey Will. I'm a big believer in finding something that works and sticking with it even though new shiny objects that sound easier come around. I've been following the same method of dropshipping since 2013 and it still works today. 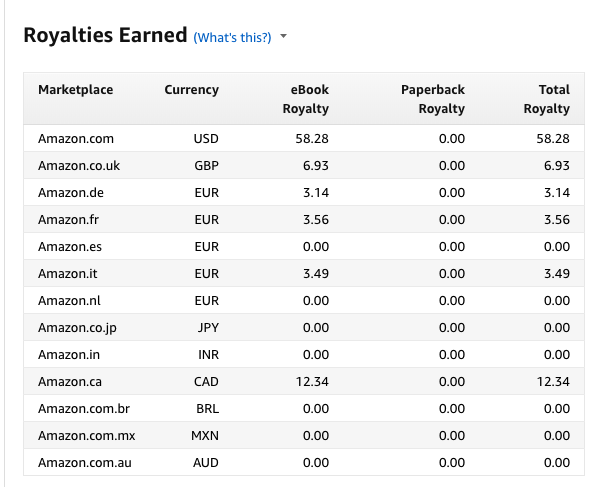 Amazon FBA also works, as well as many other businesses. However, you have to choose ONE thing and stick with it and more importantly, follow through 100% until it does. Don't get distracted and don't fall off track. P.S. You're lucky that you bought Anton's course when you did, he's been adding new content and videos to it each year along with a price increase, so if anything, you got in at a lower price, and now have a free upgrade. Johnny this is a good point on Don Mueang. Airport improving quite nicely but it is in the middle of nowhere. 10-20 smackers more and you save an hour of ground travel IF no traffic exists....of course you slam into traffic most of the time. 100%. You'll only see me flying DMK if there's an international flight that I have to take. Never for local flights within Thailand. I love these reports! Not only are they impressive by themselves, but it's helpful to see how things change and which things stay fairly constant every month. Real-life stories are always better than academic theory. Thank you for sharing! Hey Jon, happy to share. You're right that real life examples are always much better than theoretical online arguments. Also it's a good example that passive income stays relatively constant even after so many years! Johnny, I have just been to Bangkok/Pattaya. I asked about 4G mobile broadband, ie using the internet with my computer while on the go. I keep getting told that there is no such thing in Thailand. I seem to recall that previously, I could obtain a modem/sim for 3G internet. You're getting bad information. I definitely get 4G on both AIS and True as well as other phone company data plans. $350 for food and drinks. How do you do it? Eating out in Chiang Mai is super cheap. Most Thai meals are less than $2, so technically if I only ate Thai food my bill would only be $168 a month even eating out 21 meals a week. But I also eat a lot of western food which increases it. The only thing that would have killed it is alcohol but I don't drink often. That's exactly right Johnny! And that's something I realize now, so while I have very little to show for the past 3 years (besides many failed attempts at FBA and a lot of money spent on various courses)...I've learned the value in simply following through, doing the small things, being consistent day in and day out, and that these things are really the only things that will lead to success in any part of life, especially in e-commerce. I'm done and over with the shiny objects, I just want to commit to something simple and proven to work (dropshipping) and just make it happen no matter what. Ironically, it happens to be the first thing I found and the very first course I bought. If only I would have had the same outlook then that I do now, I would be much farther along. You are very right though. I bought in at a good time and though I never really finished past the niche selection part first time around, I can see that I saved a lot of money buying back then and got a ton of new updated information and videos. Very excited to continue my journey and also to continue following along on your journey. Keep it up man. Good insights Will! It's crazy to think that the first decisions are often the best ones, and the more we look around trying to find something "better" "newer" or "easier" usually ends up in a waste of time. I'm glad you're back on track! Just focus on the ONE THING and see it through! Pretty sure your friend Tung made closer to 30k last month lol. Please get him on the podcast. Hey Marc, I'm really happy to finally comfortable enough to share this transparently! I'm glad it helps you and others!